Colombo, Sri Lanka -- Challenge: The Sangha, the order of fully ordained monks and nuns, is the visible representation of the Buddha in the world; for twenty-five centuries, it has sustained the continuity of the Dhamma among humankind; by its procedures of ordination and transmission it ensures that the Buddha's legacy remains alive. 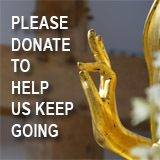 << How long will the Buddha Sangha continue to survive? The presence of the Triple Gem thus depends upon the Sangha, which symbolizes the Third Gem, the ariyan Sangha or community of noble sages who have realized the ultimate, world-transcending truth. The Sangha has survived for some 2500 years; that's longer than the Roman Empire, longer than all the dynasties of the Chinese emperors, longer than the British Empire. And it has survived without weapons, without financial resources, without armies, merely through the power of wisdom and virtue. However, there is no guarantee that it will continue to survive or that it will continue to make vital and important contributions to human life. This is a task that depends on the members of the Sangha themselves, on each new generation of monks and nuns, and this is an extremely important task, because the future of Buddhism depends on the future of the Sangha. 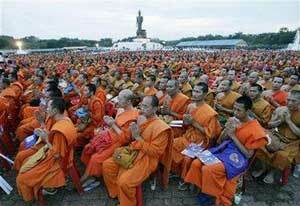 As we know, the Sangha has always existed in close interaction with the Buddhist lay community. The relationship between the two is one of interdependence and collaboration. In traditional Buddhism, the laity provides the members of the Sangha with their material requisites - robes, food, dwellings, medicines, and other material supports - while the Sangha provides the lay community with teachings and with examples of those who lead lives fully dedicated to the Dharma. For the Sangha to continue, this relationship must be maintained in some form, but the changes taking place in society may well place this relationship on a new footing. The most weighty factor affecting the Sangha-laity relationship has been the transition, first, from a traditional social order to a modern social order, and then to a technological social order. Now the distinctive mark of this change is the shift from an emphasis on industrial production to the acquisition and distribution of information. This shift has already taken place throughout the West and in the most advanced social strata in all countries around the world. It is sometimes characterized by saying that we are moving from the Industrial Era to the Information Era, from a production-based civilization to a knowledge-based civilization. The transition to an "information-intensive" society will alter the nature of the Sangha-laity relationship in radical ways, and these will challenge the Sangha to come forth with novel solutions to preserve the relevance of the Dharma. I make no claim to be a prophet, and I can't foretell the future in detail, but judging from present trends, I will try to sketch some of the more important challenges facing the Sangha as I see them. The role of higher education. In the Information Era, a high percentage of a country's population has acquired a university education. People have access to much greater stores of knowledge and information than they ever had in the past, and their understanding of mundane realities, and even of Buddhism, is much more sophisticated than in previous epochs. They will expect the Dharma to measure up to the standards they have acquired through their academic training and won't simply accept the teachings presented by monastic teachers out of reverence and unquestioning trust in an age-old tradition. They have been trained to question and inquire, and they will apply the same approach when they come to the study of Buddhism. Hence the monks and nuns have to be ready to answer questions. They can't expect to receive humble deference from the laity; they have to earn respect by clearly explaining the Dharma, and by explaining it accurately and convincingly. The monks and nuns themselves will need to have received higher education, primarily in Buddhism but also in subjects indirectly related to the Dharma, such as modern philosophy and psychology and other relevant areas. Exactly how to integrate such mundane knowledge into a monastic curriculum is a difficult issue; the solution would have to be worked out by those responsible for monastic education. The role of publishing. Closely related to the opportunities for higher education among the laity is the role of publishing. The use of writing transformed Buddhism sometime around the second century B.C. ; and so beginning in the second half of the twentieth century, the printing press and commercial publication have transformed Buddhism. There are now hundreds of books available in English on all aspects of Buddhism, both popular and scholarly, and many books are available in other languages. Thus any diligent student of the Dharma can acquire an extensive knowledge of Buddhism based on books. The micro-computer has further revolutionized Buddhist Studies. Any diligent person with a notebook computer can store an entire Buddhist library, including several Tripitakas, on his or her hard disk. Through the internet they can access vast resources on Buddhism and engage in discussion groups on virtually every topic related to Buddhism. Thus book knowledge of the Dharma isn't a special privilege of monks, and for a knowledge of Buddhist scriptures and commentaries, one is no longer dependent on the monastery, as one would have been in a traditional Buddhist culture. Buddhist Studies is also offered as a subject in universities and there are many outstanding lay scholars who are doing research in highly specialized areas of Buddhist Studies. For us, this raises the question what we as monks will have to offer. I would say that our task will not be to compete with lay Buddhist scholars. We should certainly seek to acquire scholarly knowledge of Buddhism, from as many reliable sources as possible, and we should learn from lay scholars when necessary. But what the Buddhist monastic life offers is an opportunity to put Buddhism into practice; it gives the opportunity to combine study of the texts with the living application of their principles in a life based on faith, devotion, and commitment to the Triple Gem. We have to unite scholarly knowledge with practice, intellectual understanding with faith and commitment. We cannot settle for mere knowledge without practice; nor can we have blind practice without clear intellectual understanding. The role of mental training. The Dharma will convince people not only by its intellectual appeal, not only by its practical ethics, but particularly by its system of mental cultivation. This is what distinguishes Buddhism from virtually all other religious systems: its emphasis on the central role of the mind in determining our happiness or suffering, and the practical methods it offers for training the mind. So a very important "door of entrance" to the Dharma for many people is the practice of meditation. This is the special "door" for those who come from non-Buddhist backgrounds, as has been particularly the case in the West. But meditation has also been a "door" for traditional Buddhists who approach the Dharma from scientific backgrounds and bring along skeptical, inquisitive minds. I don't think meditation alone is the answer, and in this respect I am critical of those teachers in the West who want to extract meditation from Buddhism, rejecting Buddhist doctrine and religious faith. I think a balanced approach is necessary: a triple balance between faith-and-devotion, the study of Buddhist teachings, and the practice of meditation. Faith transforms the emotions, study brings right view, and meditation brings tranquility and insight. Many people today are first attracted to the Dharma through meditation. Once they gain concrete benefits through meditation, their interest in the Dharma will be awakened and then they can be gradually led to an understanding of Buddhist doctrine, to the study of Buddhist texts, and then to faith, devotion, and even the monastic life. The Sangha as offering challenges. The Sangha seeks to preserve and honour ancient traditions, and to live without being encumbered by a excessive number of conveniences. In this way, the Sangha challenges others to adopt a frugal lifestyle, to respect what is ancient, to honour and revere the natural environment. In the modern world violence is exploding between people of different ethnic and religious groups, who are convinced they can solve their problems by the use of force. The Sangha is based on the principle of non-violence, on the conviction that patience, discussion, and compromise is essential to harmony between human beings. Thus the Sangha challenges people to solve their problems through mutual understanding, tolerance, and loving-kindness. By upholding the world-transcending Dharma, the Sangha challenges all our attempts to settle down and find a comfortable place in the world; it challenges people to understand that the supreme wisdom, our ultimate freedom, lies beyond the boundaries of the world. A voice of conscience. 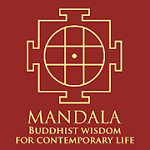 This leads me to speak about one other major challenge facing the Sangha in today's world. Today vast, terrible problems are crushing the lives of millions of people and threatening untold harm to countless others. I have in mind such problems as raging ethnic conflicts and destructive wars that take dreadful death tolls among innocent civilians, including women and children. I think of oppressive governments that imprison their citizens without just cause, torture and torment them, and hold even the free citizens in a constant state of fear. I think of the gap between the rich and the poor, and between the rich nations and the poor nations. I think of the ravenous illnesses that claim millions of lives among poor people around the world, illnesses that could be easily eliminated at minimal costs. I think of the degradation faced by millions of women forced into lives of prostitution, often by their own families, on account of their poverty. I think of the hundreds of billions of dollars squandered each year, all around the world, on weapons of enormously destructive power, while perhaps half the people in the world barely obtain enough nutritious food to sustain them each day. And finally I think of the reckless ways in which we are degrading our environment - our air, our water, our soil, our food - without any concern for future generations. In my view, it is a task for the Sangha to serve as the voice of Buddhist conscience in the world. That is, the Sangha at least its most prominent members - should be capable of giving expression to Buddhist ethical values in dealing with these vast, overwhelming problems that confront humanity today.